Trying to get a 1990 Honda CBR600F running for the wife as a learner bike. Made some great process today then ran into a wall. I have done a lot of work to this bike in the last 2 weeks. Yesterday my new intake boots finally arrived so I threw the carbs back on, reassembled the air box and tried to start it. Since it was dry I cheated by dumping a little gas down the carbs, but she started up VERY quickly and ran better than I have ever heard her. Throttle was responsive, no sputtering, very good idle. Shut it down and ran into town for errands. Figured I would give it time to cool down and then try a cold start without cheating with the gas in the carbs. COULD NOT GET HER TO START AT ALL. Just cranked and cranked. So here are the steps I took. 1. Pulled the fuel pump and tried it with solid 12V. It pumped. Reinstalled it and tried again. DID NOT PUMP. 2. Found the bank angle sensor. Removed it and TRIED to bypass it (NOT SURE WHICH WIRES/TERMINALS to connect). Still didn't start. 3. Read about gravity feeding the carbs, so I bypassed it. Bike still wouldn't start. 4. Decided to check spark. Pulled 2 different coils. Either there is no spark at all or sometimes there is weak intermittent spark, once every other second or so. So now I am at a standstill. Here are some questions if you guys could help me out. 1. I am told the fuel pump and ignition share a relay. Does anyone know exactly where this is on the bike? 2. Does anyone know the correct way to bypass a bank angle sensor? 3. What else could be causing a weak or non-existent spark? any help would be appreciated, I really want the wife to get some riding time before it gets too cold this year. So far I have changed the oil and filter, new air filter, cleaned out the starter to get it cranking, pulled the bike out of vapor lock, new fuel pump, new carb boots, removed and cleaned the carbs, new coolant, new spark plugs (yes gap tested). Check power and grounds for fuel pump circuit. Right now I would stop and fix that problem and then move on to the next. You said it ran great with fuel dumped down the carb but you aren't getting fuel flow with the good pump installed, which suggests that spark is not an issue. Don't chase a possibly non-existent problem until you fix the positive problem you identified. I don't have my manual with me (it's down at my shop and I won't be there til the weekend) but I'm sure Dennis or someone else with significant experience will have the answer to where the relay is question off the top of their head. 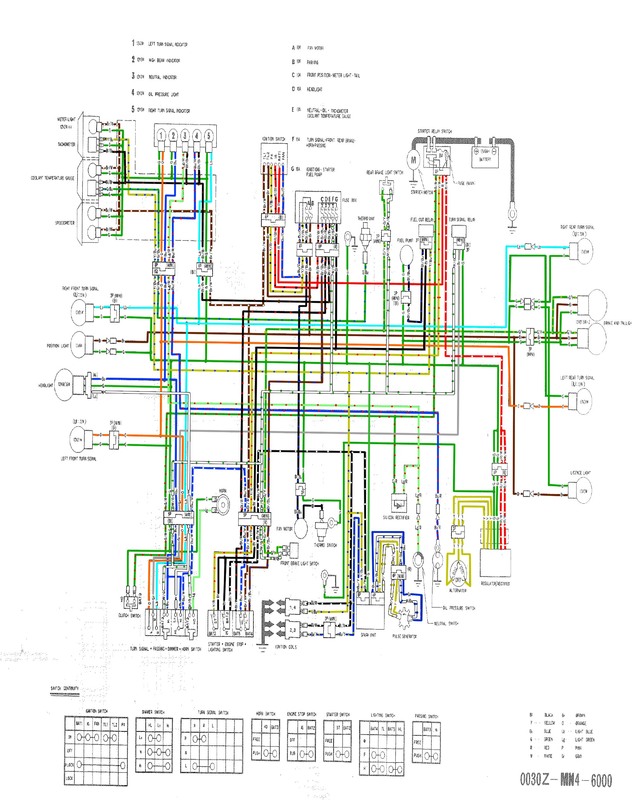 Looking at the wiring diagram I have on the computer there is a black and blue wire that runs straight from the fuel pump to the fuel relay. The relay itself has three wires, BK/BU, BK, and Y/BU. That might help you find it. I can also try to attach a copy of the diagram to this post. Stand by. Looks like it uploaded. Hope this helps. PS Isn't a Bank Angle Sensor or it wouldn't have run the first time. Agree with heresolong that if the bank angle sensor were bad then it wouldn't have started with fuel down the carbs. I wouldn't pour raw gas down the carbs. The carbs go straight into the intakes so fuel could wash down the cylinders. This is especially problematic if bike has been sitting for a long time as there isn't much oil in there. I use starting fluid on stubborn ones. Just a tiny squirt in each carb. The fuel pump relay is right by the battery box. I rarely suspect this as a problem. 1. If you have a Wal Mart close by pick up a bottle funnel tube. They have a soft rubber one that has a hose on it. They fit onto a plastic coke bottle. You can put this on the hose that goes from the pump to the carbs by sliding a smaller fuel hose inside. Then fill the coke bottle with fuel. You can squeeze it carefully to fill the float bowls. Sometimes the carbs take a bit to fill when trying gravity feed. This forces fuel in there. You can run the bike on the bottle. I use this to sync the carbs also. 2. The enricher (choke) circuit is really hard to get clean. Most people miss this entirely. You need to pull the pistons and spray carb cleaner into the hole and make sure it comes out the other side. If the engine is stubborn I usually manually choke it by putting my hand over the carb throats once the engine pops off. You have to do each one. They usually will pick up one cylinder at a time. Be careful just in case it backfires. 3. Set the idle **** all the way in to the highest setting. This makes it easier to get it going after carb rebuild. They will run at about 2500-3000 RPM if each carb throttle position has been adjusted right when you put them together. I bench set the throttles to the lowest point to get the most idle adjustment. This is done using a .005" feeler gauge in each carb to get each throttle plate static bench synced. This is not discussed in the manual from what I remember. It's just something I do to get as close as I can after rebuilds. It will still run out of sync, but might be erratic. 4. What did you set your pilot screws at? Can't remember if we talked about this but these should have been taken out during cleaning and carb cleaner sprayed in the jet tube and the hole where the screw goes. Fluid should come out the little hole at the front of the carb throat in front of the throttle plate (butterfly). I set them at 2 1/2 turns out. I grind off the protrusion on the pilot screw caps so they can be adjusted on the bike later. Honda put the stop (protrusion) on them to meet EPA requirements (so you can't adjust them). Be sure to eliminate the obvious before chasing down other things. If you do what I suggested above, you will bypass the fuel pump so that and the relay are out of the equation. These suggestions are based on what you described. If the engine fired with fuel down the carbs, you aren't getting fuel...it's pretty simple. I've had many that were stubborn like this after carb rebuilds. It could be as simple as that fuel hasn't gotten to the float bowls. The spark issue makes no sense if it ran with raw fuel. Might be that it's hard to see. The reason you only see a spark every second or so is because the other 3 cylinders have to fire. When your cranking on the battery it takes some time to come to the one your looking at. Last edited by dennisgb; 10-19-2016 at 09:24 AM. Ok all, thanks for the advise. I will start chasing fuel issues today as well. The main reason I started with electrical is because the fuel pump isn't getting power and I don't know why. I have bottle fed a bike like you mentioned, and will do it again. Right now I just have the tank unbolted and rotated towards the back of the bike allowing me access to the carbs and no, the fuel line isn't twisted. I did not mess with the pilot screws, to be honest I don't even know where they are. Can anyone provide a picture? I searched the forums here but the pictures people have posted for these are dead links now. What I did do was remove every brass fitting I could inside each carb and sprayed through them and every other channel I could see in there with carb cleaner, then reassembled. I figured since after the initial dump of straight fuel the bike ran great, which meant fuel delivery was happening. I let it run for about 5 minutes including revving, which means it was getting it's own fuel at that time. Maybe since I did get it running it was sucking the fuel it needed itself through the fuel pump and the pump wasn't running even then. I don't know. 1. You lost me at "enricher (choke) circuit is really hard to get clean". Forgive my ignorance, but are you referring to the lever that when manipulating the choke function on the handlebar slides side to side behind all 4 carbs? 2. Is the "bank angle sensor" and the "fuel pump relay" one and the same, or are these 2 separate parts? I found what I believe the BAS right next to the battery in it's own rubber sleeve but have yet to find another fuel pump relay. I can't figure out why the pump isn't getting 12V. Like I said earlier you need to stop chasing problems that may or may not exist. It's common to think all sorts of things are wrong. Run the bike on the bottle to start with and bypass the pump. If everything is clean and adjusted properly it will run without the pump. Now to be perfectly blunt...your carbs are not clean based on what you posted. You have to take the enricher (choke) pistons out of the carbs and spray through the enricher tube (next to the main and pilot jets) and back thru the hole where the pistons came out. Insure that cleaner comes out the other ends. There is a needle on the end of the piston that opens and close the passage that lets fuel thru when the choke is turned on. These plug up. There is a black plastic hex cap on them that needs to be unscrewed. Then the pistons will come out. If you sprayed carb cleaner with them on everything is now up in the choke circuit. The engines are impossible to start if the choke circuit is dirty. The pilot screws have to come out. DON'T TRY TO REMOVE THEM WITH THE FLOAT BOWL COVERS IN PLACE. You will break the screw caps off if you try to do this. They have a stop on them as I explained previously. I grind them off when the screws are off so they turn when the carbs are assembled. Again if you sprayed cleaner in there without taking the pilot screws off then all the crap is up in there. They also get gummed up from sitting. The pilots screws provide air to the fuel mix. If they are plugged or dirty the engine can't pull fuel from the pilot jet. Be careful to get all the parts out when you take them out. There is a tiny metal washer, a spring and a rubber seal. They are very small and they stay in the hole when you take the screws out. I use a tiny bent metal pick to get them out. These parts must be put back in the correct order. Spring first, metal washer, o-ring. The o-ring will fit over the step on the screw and help hold the parts in place as you insert them. I do this with the screw in an up position so as not to lose the parts. Take the pilot jets out so you can spray carb cleaner into the jet hole. Cleaner should come out through the hole where the screw was and the hole at the front of the intake in front of the butterfly. Spray back through the pilot screw hole. Spray should come out of the pilot jet hole and the hole in front of the butterfly. Seat the screws lightly (turn all the way in until you feel resistance). Don't use much pressure or you will damage the tip. Turn them out 2 1/2 turns. Here is a crappy picture of the pilot screw location. They are on opposite sides for each bank so you can get at them when carbs are on the bike. You may think you can get away with not doing this, but trust me it won't run right if at all until you get your carbs clean. What you did is a common mistake. People all over the web tell you to just clean the pilot jet...that is wrong. There are many threads on here where people went through multiple carb cleanings and finally had success. It take time and knowledge to do it right. 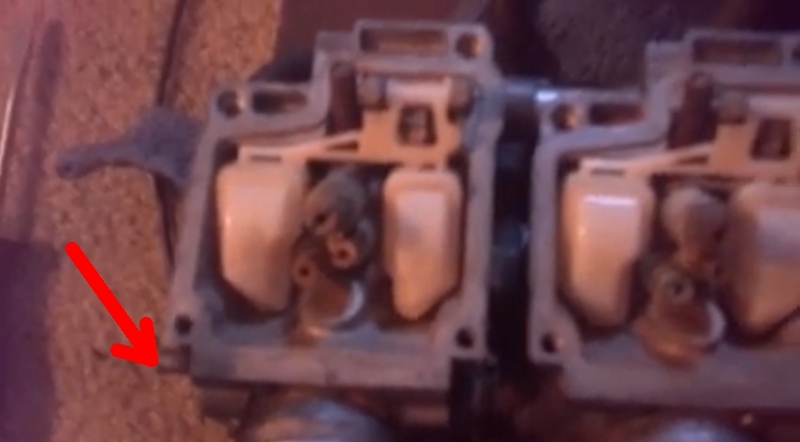 Here's a little video that shows how a CV carburetor works. It might help your understanding of the critical parts and function. Ok gotcha. So the large black plastic pistons inside each car are the "choke pistons", correct? I did remove these and am pretty sure I sprayed carb cleaner down the holes that the attached needles came out of, though I had no idea what they were at the time. I am fairly sure I did not remove the pilot screws, so what you said is making sense. I may as well pull the carbs back off again and do all this before trying the fuel pump bypass since they are still easy to get to right now. I do not have one of those carb synch devices, but I will make the adjustments as you mentioned. I found a good write up for synching carbs after removing the pilot screws, but that article advised going 2 turns out for US models. Last edited by projo198; 10-19-2016 at 11:58 AM. Quick Reply: Almost got it running... almost.